The Schou family of Lake Oswego practices the unique specialty of ocularistry. They are three of less than 170 in the United States who make artificial eyes. With less than 170 ocularists in the United States, you know it is a highly specialized profession. How, though, do we explain the good fortune of having three of the country's ocularists living and working in Lake Oswego? And what even is an ocularist? An ocularist is someone who specializes in the fabrication and fitting of ocular prostheses, or artificial eyes, for people who have lost one or both eyes due to trauma or disease. Lake Oswego happens to have three ocularists in the community. 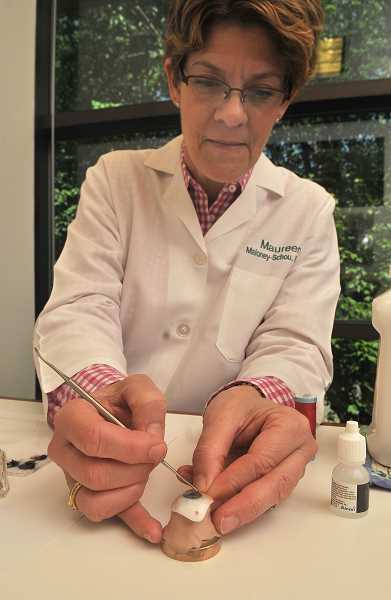 Kevin Schou (pronounced scow, rhymes with cow) and his wife, Maureen Maloney-Schou, owners of Maloney's Ocular Prosthetics, have been in the practice of making artificial eyes for 40 years. Their daughter, Katherine "Katie" Schou, has joined the family business, located at 4500 Kruse Way Plaza, Suite 300 in Lake Oswego. It's actually a third-generation family business, as the company was founded in 1948 by Maureen's father, Bernard A. Maloney. He received his initial training at the Medical School at the University of Maryland in Baltimore, and came to Portland to serve as the chief of the prosthetics clinic at the veterans' hospital. During that time he also was the director of the prosthetics clinic at the University of Oregon Health Sciences Center (now Oregon Health Sciences University). He retired from those positions and initiated a prosthetic clinic at Legacy Good Samaritan Hospital, and then entered private practice in 1976. Maureen joined him in 1978. Kevin Schou graduated with a degree in anaplastology (a branch of medicine that concerned with the prosthetic rehabilitation of a missing, disfigured or malformed anatomically critical part of the face or body) and ocularistry from Stanford University Medical Center in 1980. He was instrumental in forming the American Anaplastology Association, and served as its president from 1988-1990, and provides anaplastology services to patients around the world today. Both Kevin and Maureen are board-certified ocularists and board-approved diplomate ocularists. (A diplomate is one who holds a diploma, especially a doctor who a board has certified as a specialist.) Maureen is also a Fellow of the American Society of Ocularists and has served as the organization's education chair, chair of the admissions committee, has sat on the board of directors and is a past president. 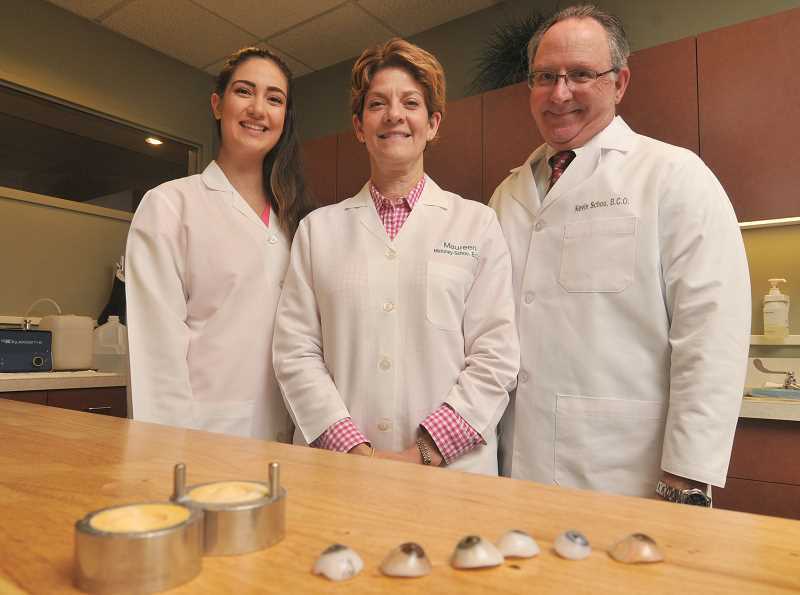 Both Kevin and Maureen have more than 30 years of experience in the field of fitting and fabrication of ocular and facial prosthetics. Katie is apprenticing with her parents, and apprenticing is the only way to gain this highly specialized training. It will take five years and more than 30,000 hours of training for her to be eligible for certification by the American Society of Ocularists. It's a profession the whole family feels is well worth the effort, as every day they help people feel good about themselves. "The good part is that medical science is saving more eyes," Kevin said. "But there is still much need for our work." The Schous say ocularistry is a combination of creative artistry, anatomy and medical science, and gives them a creative outlet. "We're on a journey with our patients and invest a lot of ourselves in making their lives better," Maureen said. "We can play a small role in making their lives better." "We don't want people to notice our work," Kevin said. "We want to help patients get their self-confidence back and close the chapter on the trauma (that caused the eye loss)." To begin the process of making a prosthesis, the Schous take a painless impression of the eye socket to ensure a proper fit. Once the impression is done, a wax pattern is made of the impression to ensure a correct fit and gaze. After the fit is found, the ocularist begins to paint the background color of the iris, taking care to match the natural color of the iris. The Schous hand paint every iris to create a life-like quality to the prosthetic. Once the background color is painted, a mold is made from the wax pattern in plastic. The ocularist adds blood vessels and the rest of the iris colors to the prosthetic. "We use silk thread to create the blood vessels," Kevin said, explaining that they "look realistic." Their work is so realistic a patient reported that during an eye exam a medical professional put eye drops in an eye with a prosthetic, not recognizing the eye was not real. Prosthetics must be replaced every 7-10 years, and even sooner for growing children. "Your children's feet grown and their eyes will change, too," said Kevin. "Even their eye color will change as they grow." The Schous make it their mission to be a positive influence in their patients' rehabilitation process and build positive, lifelong relationships with their clients. "We put our heart and soul into what we do," Katie said. "And the hugs and kisses we get afterward are priceless." In addition to seeing patients in their Lake Oswego offices, the Schous see patients in satellite offices in Eugene and Medford in Oregon and in Anchorage, Alaska. The Schous' son, Michael, a student at Oregon State University, will join the family business upon graduation, so he and his sister will ensure that the mission of providing excellent ocular care will continue when Kevin and Maureen decide to retire. To learn more about Maloney's Ocular Prosthetics, visit maloneysocular.com or call 503-675-1320.